What’s the difference between hypertrophic scars and keloid scars? 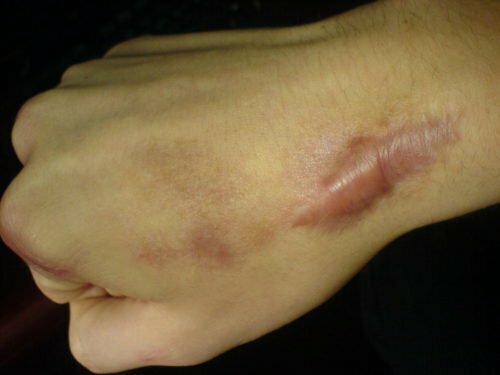 Hypertrophic scars are thick, raised scars that develop in the area where skin is injured. Scars are normal during the human body’s healing process, but a hypertrophic scar is the result of an abnormal response to the skin injury. The body produces too much collagen, so the scar grows larger than a normal scar. Keloid scars and hypertrophic scars are very similar to each other, but the main difference is that hypertrophic scars do not grow beyond the site of the original injury. Keloids do continue to grow beyond the original injury site. No. Keloid scars are benign, and not contagious. How do keloid scars form? After skin has been injured a scar is formed. The body produces excess collagen and connective tissues that extend beyond the original damaged area. They can grow to unsightly proportions. Why do people get keloid scars? Keloid scars appear in about 5-15% of the world’s population, equally affecting men and women. Although those with darker skin are more likely to develop keloids, they can appear on anyone regardless of skin type. It’s possible that due to higher melanocyte concentration in the skin, that’s why African, Hispanic, and Asian populations experience a higher frequency of keloids. It’s also possible that there is some degree of genetic predisposition to the formation of keloid scars. How can I avoid keloid scars? While there are common causes of keloid scars, such as injury and piercing, the medical world does not fully understand why some people are more prone to their development than others. It’s not possible to predict whether one injury or another will grow a keloid scar. The best option to avoid keloid scars is to avoid injury to the skin. How can I treat my keloid scars? Sensus Healthcare offers successful keloid treatment and removal via the SRT-100ä, a revolutionary machine that utilizes superficial radiation therapy to deliver precise, calibrated doses of radiation to the uppermost layer of skin, safely and effectively destroying the cells that form keloids. Do you have more questions about keloids? Are you interested in learning more about the SRT-100 to treat your scars? Contact Sensus Healthcare today.